Using center pull paper towels is a good way to help cut down on costs and to help ensure that your work environments are as sanitary as possible. 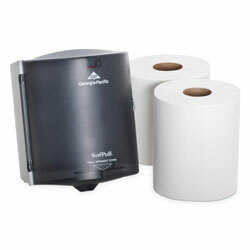 Using a product like this Georgia Pacific paper dispenser is something which can offer you many benefits of this type, but until you've used one, you can't be sure if you're going to like using a center pull towel dispenser over other models. This trial unit provides you with the perfect opportunity to see if this type of dispenser is for you. This center pull paper towel dispenser offers you a no risk trial method of seeing if making the transition to center pull paper towels is something which could interest your business. This Georgia Pacific paper dispenser comes with rolls of towels so you can set it up and start using it right away. You will enjoy consuming fewer towels thanks to the single towel dispensing. The towels from this center pull towel dispenser are strong and absorbent, and after using this trial unit for a short period of time we think you'll be ready to start using this type of dispenser full time. Includes SofPull® regular capacity center-pull dispenser Georgia-Pacific SofPull® and two rolls of SofPull® towels Georgia-Pacific SofPull® 28124. Touchless dispensing minimizes the risk of cross contamination. The soft, absorbent towel dries hands quickly or wipes up large spills and tough messes. One-at-a-time dispensing minimizes waste and minimizes the amount of time spent refilling. Regular capacity 320-sheet rolls for steady traffic areas and extended service intervals. Towels Dispensers Type: Roll Towel Dispenser; Material(s): Plastic; Capacity (text): 1 Roll; Color(s): Translucent Smoke. Translucent Black Centerpull Paper Towel Dispensers from Georgia Pacific! 299 In Stock today. Easy to install and so convenient. Easy to refill too. This towel holder works really well for higher traffic areas. Dispenses easily, and the towels unroll well so you don't need as many.